At around noon on Tuesday, a bull was spotted wandering the sidewalks of New York City, in Brooklyn near Prospect Park. Initially it was reported that the bull was a cow, but was this later revealed to be wild speculation. First reports of the animal were generally murky. Squint. Wherever the bull went he caused quite a bit of excitement. At one point, helicopters could reportedly be heard hovering above the bull as cops tried to trap it between two nets or, perhaps, goals posts. After a couple hours, several local news outlets, which had obviously rushed to the scene to cover this amazing story, declared that the bull (they were still calling it “cow,” but we’ll let that slide) had been caught by police. 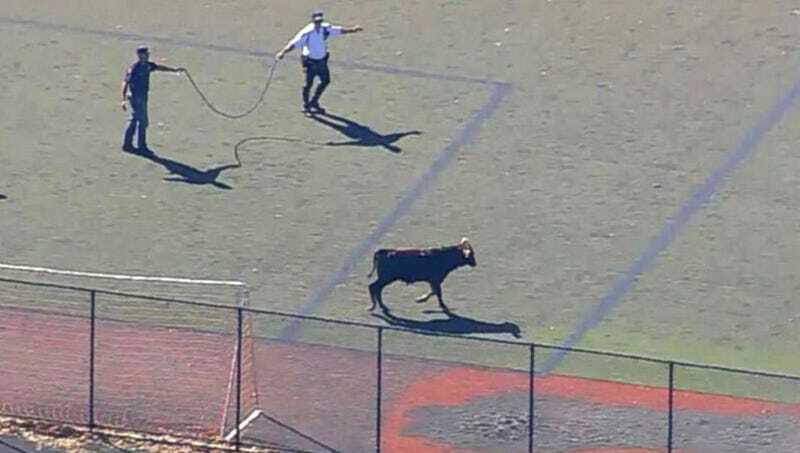 Ultimately the cops put down the nets and shot the bull with a tranquilizer pistol. The bull was loaded into a police horse trailer and hauled to Long Island, from whence it will reportedly travel to an animal sanctuary in Wantang, New Jersey. The New York Times reports that there is some precedent for bulls wandering the streets of New York City unchaperoned…although to be honest it did not go so well for the previous bull, who in 1999 escaped from an “illegal rodeo” only to be shot dead by cops somewhere in Queens.